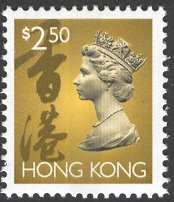 A Note Prior to the Real Detail. 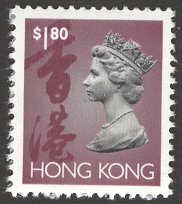 Anyone collecting the stamps of the colony should invest in a copy of the definitive catalogue for the stamps of Hong Kong which is "Yang's Postage Stamp & Postal History Catalogue of Hong Kong". 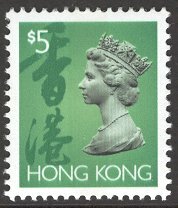 This is the "local" catalogue, is easier to follow than the Stanley Gibbons equivalent and I denote Yang Catalogue numbers where applicable as well as SG for this reason. 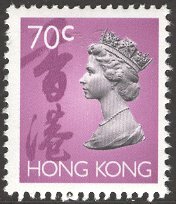 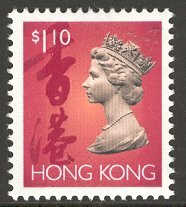 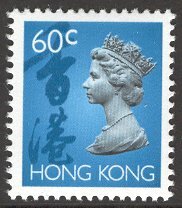 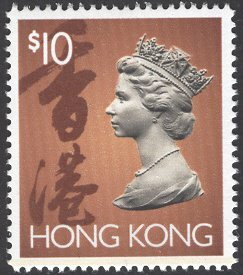 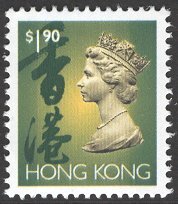 A copy of this can usually be picked up on eBay quite cheaply and if you are not too concerned with an up to date valuation - which is in HK$ anyway - purchasing any year from 1998 onwards will always give you all the information you need on the stamps whilst it was a British Colony. 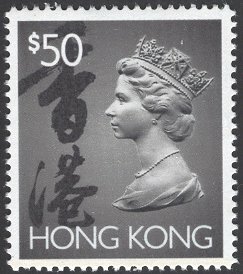 The first Queen Elizabeth II defintives were issued on 5 January 1954 and the designs were changed five times before 1997 viz. 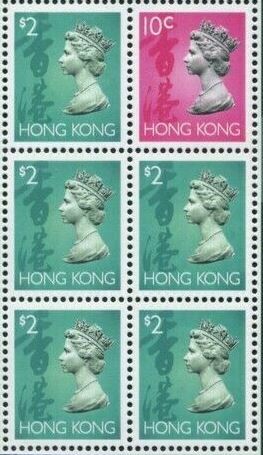 1962, 1973, 1982, 1987 and 1992. The 1954 Wilding issue bears the Script CA watermark and a new watermarked paper bearing Crown Block CA was introduced by the Crown Agents for the 1962 Annigoni issue. 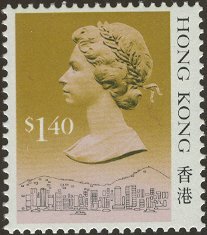 A new watermark Crown Spiral CA appeared on the 1975 re-print of the Machin issue of 1973. 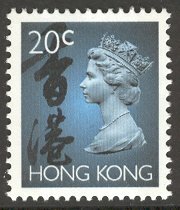 The Multiple Crown CA watermark was used on the issue of 1982, and subsequently reprinted in 1985 with no watermark. 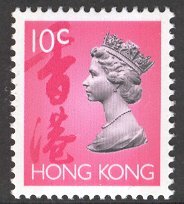 No watermark paper was used for all subsequent definitives after 1985 (with one exception in 1994 - see below). 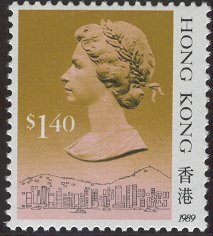 In 1987 the so called "Skyline Definitives" first appeared. 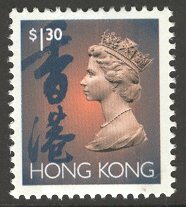 There are several varieties of this issue as they were subsequently re-printed every year through to 1991 with marked differences to each. 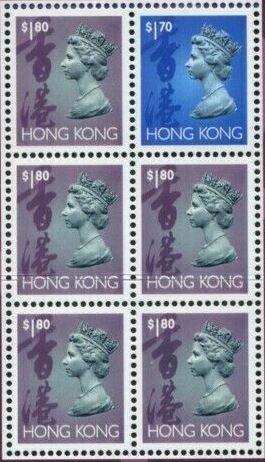 The identification of these are explained in a later section. 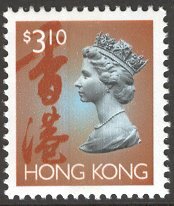 The primary interest of this site is the Machin Definitive issue distributed between 1992 and 1996. 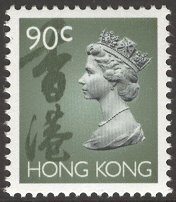 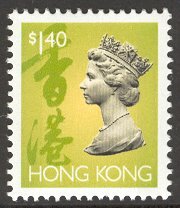 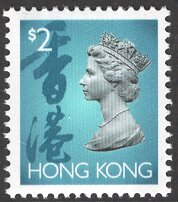 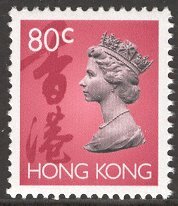 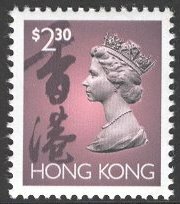 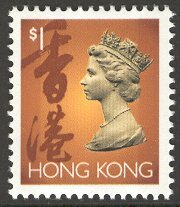 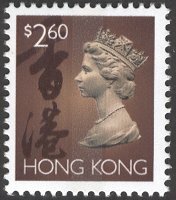 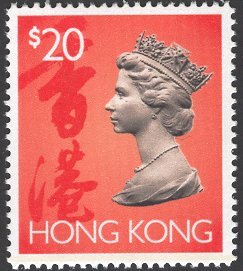 On 26 February 1997, the first set of definitive stamps bearing just the inscriptions HONG KONG, the so-called "Neutral Definitives" without the Queens Head were issued prior to returning of sovereignty to China on 1 July 1997. 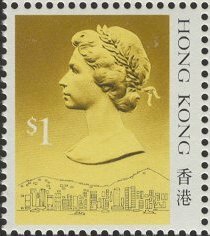 First issued on June 16th 1992 with a design based on the Arnold Machin bust also used on Great Britain definitives of the same period. These were issued in two distinct issues in 1992 and 1996. 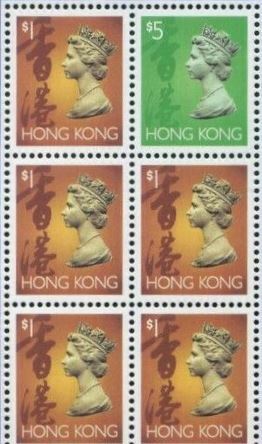 The 1996 issues vary from the originals both by printing method and by the addition of Phosphor Bands. 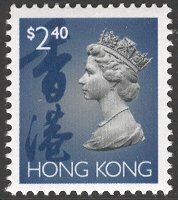 Both sets were printed by Enschedé with perfs of 14 x 14.75 with the exception of some of the booklet stamps which were perforated at 14 x 14. 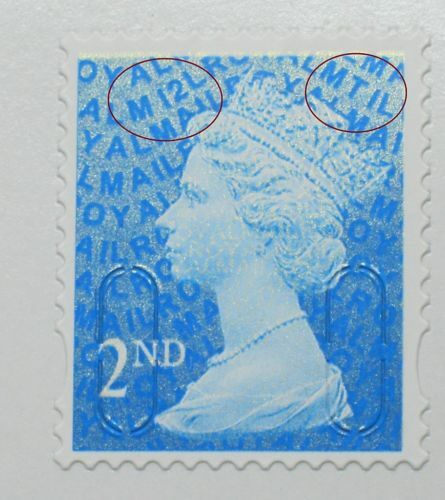 Other booklet stamps were perforated at 14 x 14.75 but printed by Leigh-Mardon Ltd with a 'Multiple Crown CA Diagonal' watermark. 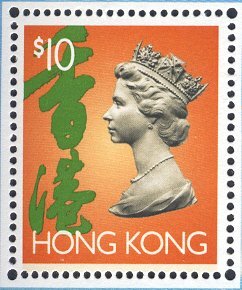 The 'Machin' Definitives were issued in Sheet, Coil, Booklet and Mini-sheet format. 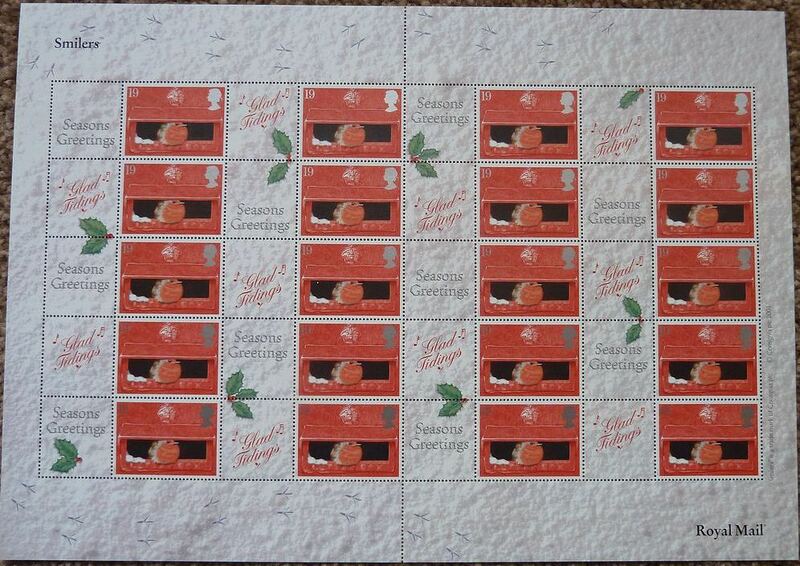 The SG range is 702-717 (Photo) and 757-765 (Lithography), the equivalent Yang Catalogue numbers are 404-444. 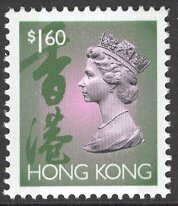 So we already have a number of varieties to study. 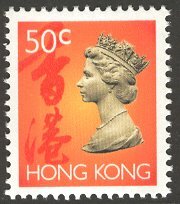 These definitives were produced over a 5 year period and each year can be distinguished easily. In the case of 1987/1988, the former show the Queen with a deeply shaded chin whereas in the issue of a year later - the chin has been considerably lightened.